Unlocator Review - Is This The Best Premium DNS Service? The Internet has without doubt changed the way we live our lives; it has also come to be very quickly, and appears fully formed after just a couple of decades. These days the average mobile phone can access the Internet with ease, and with mobile hotspots appearing everywhere, browsing on the move is an everyday occurrence. However, some content – especially that which is streamed to your device such as movie and music channels – can be difficult, or impossible, to get in certain geographical regions. The Internet is rife with what the industry refers to as ‘invisible borders’ which block access to some content, so what if you are on the move and want to watch a movie on your favorite channel? Unlocator.com may be the answer, and we took a long look at what it is, how it works and whether it is for you. 3 Do I Need Special Software? 4 Can I Use it on a Tablet? 6 What Else Should I Know? 8 Can I Use it on any device? 9 What about if I need help? Unlocator is a simple system that allows you to appear to be in a different location to that which you are actually in. For example, if you travel to a country in which your chosen movie channel is not available, or is deliberately blocked, you will not be able to stream movies to your devices. 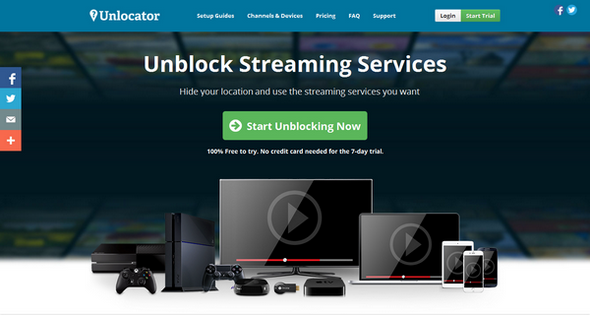 Unlocator can indeed help you unblock Netflix, Hulu, Amazon Instant and 60 other channels, without any location restrictions. By using Unlocator you can effectively fool your device into believing you are back home, or wherever the content you want to access is broadcast, and stream to you device. Unlocator is known as a ‘Smart DNS’ and differs to the popular Virtual Private Networks (VPN) in a number of ways. By bypassing the firewalls and using remote servers it allows you access to more content that you are geographically limited to. Without going into too much technical detail, here’s a brief outline of how Unlocator works. Every single source of information on the Internet is transmitted by what are known as DNS servers. There are many thousands of these across the world, operated by different service providers. When you log into a movie channel, for example, you are using a server in a set location to receive that information; however, not all information can be automatically transmitted everywhere. What Unlocator does is alter the location you are in – not physically, of course – so that the relevant server can send you the chosen information, wherever you might be. Even if you are in a location where your channel is not broadcast, or is not permitted, you can find it using Unlocator. In short, no; Unlocator is applicable via the website, and is surprisingly easy to set up. The website includes detailed instructions on how to set up Unlocator on a wide range of operating systems and devices, and it notably covers Windows systems right back to Vista. We found it simple, also, to set up for a number of different devices at the same time, but would advise having someone who understands how to change router settings around if this is your choice. Once you have set it up correctly it’s very easy to use: you simply access the chosen website as usual, and away you go! Unlocator can be used on many different devices; we found it ran as well on a tablet as on a PC, and it can also be used on games consoles, smart TV’s and laptops, as well as a smartphone. Furthermore, there is no effect on the bandwidth, and speed is not affected either. We enjoyed using it on a smartphone when on the move as it gives access to plenty of content. At the moment the service covers more than 150 channels over a wide variety of choice; these include Amazon Video, BBC iPlayer, Fox, MTV and plenty more popular channels, as well as country-specific channels from such as France, Finland, the Netherlands and many more from Europe and across the world. The possibilities are endless, and Unlocator is adding more services all the time. We are assured that Unlocator is safe and secure, although it’s worth remembering that no data transmitted across the Internet can actually be 100% secure – there’s always a slight risk. It is completely transparent, and does not affect the other services you may access on your devices such as banking and social media. The beauty of this Smart DNS proxy is that it expands your possibilities in terms of streaming content; if you want news from elsewhere – or back home, should you be away – you can access a variety of channels (there is a comprehensive list on the website), or should you want to catch up on TV programs there are channels to cover this. Furthermore, you can actually ‘be’ in different locations at the same time, so you can watch streaming from various places. You’ll want to know about the cost, of course: well, the great thing is that there is a completely free 7-day trial available, which gives you the chance to experience Unlocator before opting to go for it; there is no obligation, and you don’t have to provide credit card details for the trial. After this, there are three pricing plans that you can choose from: a recurring $4.95 per month; six months for $27.50; or a 12-month contract for a one-off price of $49.95. We consider all of these extremely good value for the sheer breadth of coverage you are accessing. Unlocator is a clever service that will benefit many users in many locations. It offers easy access to your favorite channels from locations where you would not normally be able to access them, and does so by simply changing the DNS code on either your device or router in easy steps described in detail on the website. It’s cheap and very capable, and we can see it becoming extremely popular. For a brief recap, check the following FAQ’s. Can you explain what Unlocator is? Unlocator is a service that, by changing your location settings, allows you to access content from many different places that may have been otherwise impossible to access thanks to your location and permissions. It does so without changing your IP address. You follow the instructions on the website relating to your device and operating system, and set up Unlocator either on many devices via your router, or on individual devices. It is very simple to do. You can take a free 7-day trial, after which it costs $4.95 per month or you can choose from six and 12 month packages. Unlocator accepts Visa, MasterCard, Dankort or PayPal for monthly subscriptions. Can I still use other services? Yes; using Unlocator does not affect any other services you may use on your devices, such as online banking and social networking sites. You can use it on a PC, laptop, tablet, smartphone or games console that accesses through the router. Unlocator offers full support plus a range of detailed descriptions regarding troubleshooting, set up and general use on the comprehensive and easy to navigate website.